Montreal. Oh Montreal. What a great city to visit, even the trip up and back are great. I would have loved to have spent more time there, being lazy, spending the morning with a latte at a sidewalk café and the afternoon enjoying a bike ride along the canal or through the parks. For the most part, Montreal did not have the same architectural feel as Brooklyn, but it had the same life style feel I felt as Brooklyn, more relaxed, people enjoying the outdoors. I can get behind that. Even though we only had two days to see the city in, we still found some time to act like a local… I think. Christine and I headed to Bar St. Sulpice after we dropped our stuff at the apartment on Friday evening. Christian was a few hours behind us and this place was close to the bus station with high recommendations from Kurt and Melissa. The street it is located on reminded us of St. Marks in New York and was busy on a Friday night. The massive backyard area was packed and the three levels of interior were empty. It was a beautiful night to be sitting outside with a drink in hand. Since Christian had to be able to find us, we opted to sit on the small front deck were we would be easy to spot and still outside. We ordered our drinks and then someone else came to take our food order. And then we paid for our beer and then had to pay a different guy for our food. It was a bit confusing and strange because they wait for you to give them their tip, you didn’t get to leave it at the end. Anyway we had our official Canadian dish of poutine, fries and cheese curds covered in brown gravy. Talk about delicious. After Christian arrived and had a drink, we realized we were all exhausted and went through the massive backyard, which was even bigger than we thought, to the street home. On Saturday we started bright and early headed straight to the bike shop were where picked up the day’s transportation. 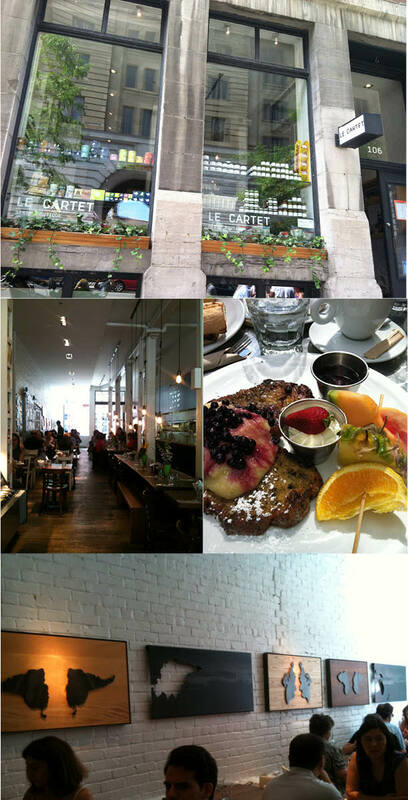 Then, in a failed attempt to find the breakfast spot recommended by Melissa, we ended up at Le Cartet for breakfast. 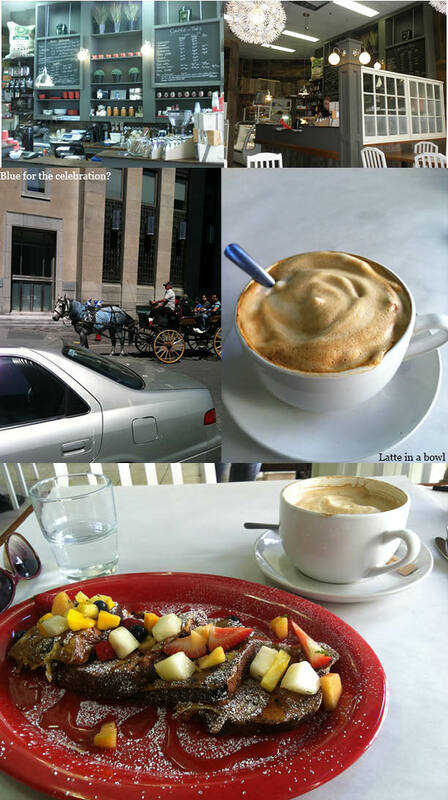 There are two options for lattes in Montreal, cups or bowls. Christian and I both made the mistake of going for cups the first morning, the bowl just seemed to big. The cups were too tiny. We went for bowls after that. Regardless, the food was delicious. When they brought out our food they announced it in French and we thought we each had the right thing, but Christine and I had actually mixed ours up. They both had blueberries on them and I assumed I had some sort of mushed up banana on mine which her custard looked like. So after a few bits, we realized our mistake and split the difference, two half breakfast’s is always better than one I think. We sat out on the sidewalk because it was so nice and I kind of wish we had taken more of a look inside because I loved the interiors. The finishes were great and I wanted to take home some of the wood and steel map silhouettes. I only went in to use the restroom and didn’t take my phone so I made Christian take his with him and take pictures for me. Thank you! Next stop was lunch at Maisonnuve Market. There were too many choices between simple lunch sandwiches, to coffee and sweets to fresh veggies and fruit at all the different shops. They have a few of these markets all over the city and they are pretty cool. Brooklyn needs a few of these, I bet there are some old warehouses just waiting for something like this. After a nice break, we headed out once more for the long portion of our bike riding day over the Jacques Cartier Bridge to St. Helen’s Island to see the Biosphere. It was built for the World Fair Expo in 1967. I didn’t think I was really going to care much for it, but I actually really liked it once we got inside. I love how the hard rectangular shapes are nested in the sphere as you see them from below. My mind could change from other vantage points I suppose. I also really like the propane tank flamingos in the front pool. I want one. And a reflecting pool. We continued our island hopping on over to Île Notre-Dame, which I was sure also had a church with the same name… not sure where I got that idea other than the name, but I also knew that the island was that name so who knows. I probably read something about some other church with a less memorable name and mixed it all up. 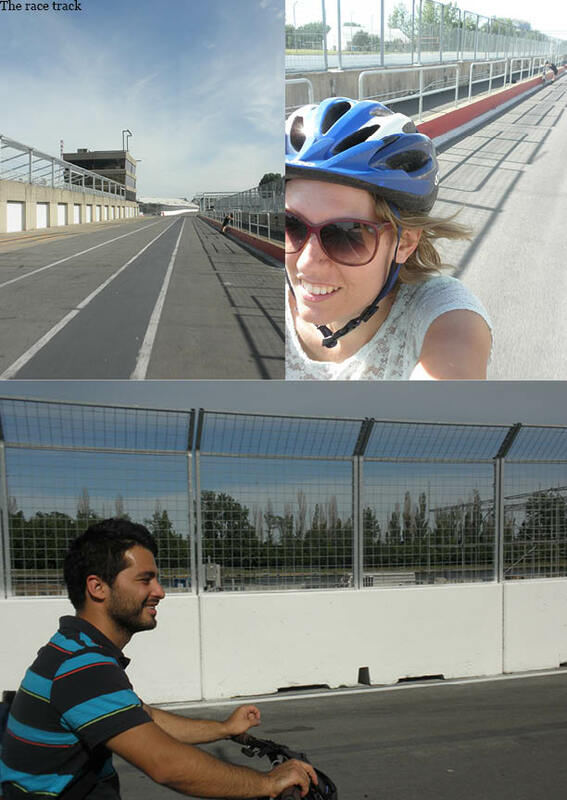 Anyway, on this island we could ride on the Formula One Race track, Circuit Gilles Villeneuve. Now, I don’t pay any attention to car racing. I couldn’t tell you the difference between one kind and another. After a long straight stretch along the ’76 Olympic rowing and canoeing basin, I was sure we were not actually on the track. I mean a bus came by. It wasn’t an oval. It has all kinds of tight turns. Christian did a good job of correcting me. Along with my church-island mix up. Whoops. Christian I did start racing on our rental bikes, but those things got nothing on our Fancy bikes in Brooklyn, and, like I said, a bus went by and I was sure we were not actually on the track so I stopped somewhere along the long stretch. He would have won though. Dang it. 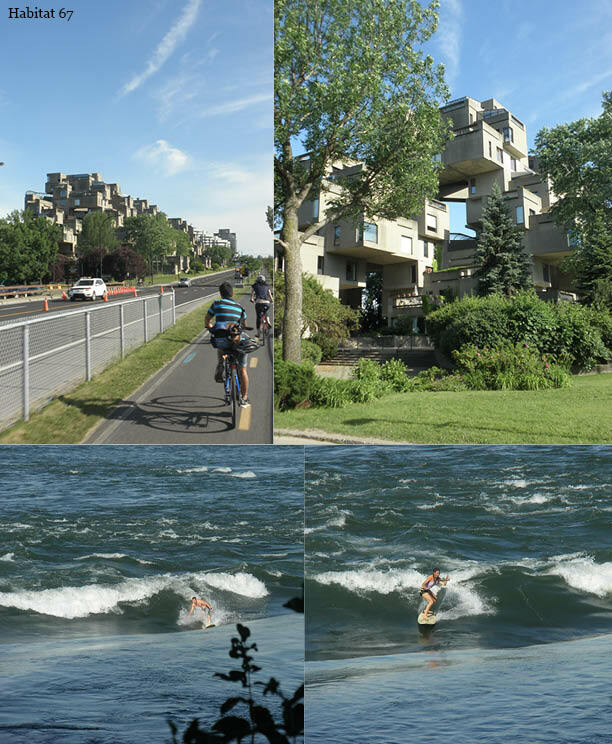 Moving right along, we hopped back over and across the southern tip of St. Helen’s Island on to the peninsula Cité du Havre where Habitat 67 is located. We wanted to get a closer look, poor Christine stuck with two architects, and that meant crossing the street at a marked intersection. We were making a left turn which meant crossing over a bike lane as well. Christian made it fine, but Christine after him almost got T’ed by a guy who passed me and was trying to pass her on the left. True she could have signaled. True he could have warned her with a bell or something. I yelled at her when I saw what was about to happen and she swerved back on course. He hit his breaks hard and was going so fast that he went over the handlebars and landed on his nose. It wasn’t pretty and we felt terrible because he wouldn’t let us help him. Some other guys pulled up a minute or so later and helped him. When he finally talked to us, I think because he knew we were not going to just leave, I was relieved that he wasn’t missing teeth, he just bit his lip and had some road rash on his nose. He was fine, I guess, although the real pain probably surfaced the next day. The good side of this unfortunate accident? We were still hanging around to see a group of people go behind a fence on the back side of Habitat 67. Naturally we decided to follow, better view of the building and whatever else may be happening back there. After making our way on a root filled dirt path lined with the fence on one side and trees/ bushes on the other, what we found was people surfing on a standing wave. It was pretty awesome. Back on our bikes, we spent the early evening riding around the Lachine Canal trails until wee had to return our bikes before the shop closed. After we headed back to the apartment to freshen up a bit before heading out for the evening. We headed back to the Old Port area for dinner where there was suppose to be fireworks for the Celebration of St. John. This information ended up being wrong, the fireworks were the next night, if we had known that we might have ventured to a different neighborhood for dinner, but we still found a fun place to eat called Bevo. One of the main criteria was outdoor seating. The whole area was full of people out wandering the streets, drinking and eating. It was kinda great. We all ended up ordering pastas once we found out that the brick oven was backed up and hour or so for pizzas. And we had fancy drinks because why not? After dinner we hurried down to the pier and decided either we missed the fireworks or they didn’t happen that night, we were skeptically about it to begin with. So we just wondered around the water front and went up to the rooftop of the Auberge du Vieux-Port (a hotel) for a drink. We got up there to find out the bar was closing, but not before getting to enjoy the sweet view. Sunday morning we headed straight to the nearest bike share station before trying to get breakfast. The original destination was closed, like so many other places we would fine out, for the holiday celebration. We walked down the street a bit and found Thé mon Café. This time Christian and I were smart and ordered lattes in bowls. Mmm mmm. It seemed to primarily be a coffee shop but they had a few special breakfast items , your typical pastries and sandwiches. I have never had fruit cake before and never really had a desire to have it either. As french toast, it is top notch. Add some fresh fruit and really good syrup and your set. The owner was really nice and told us about this open air bar on the water front that had this Sunday music event call Love Sundays and good sangria that we should check out that afternoon/early evening. He also confirmed the fireworks were suppose to be Sunday night. Yeah! Bellies full, we set out to see one of Mies van der Rohe’s last creations, Westmount Square. It is a collection of four towers that are mostly residential and offices. There is a shopping center, but since it was a holiday, it was closed. After wandering around like silly architecture students we headed over to the Mile End Neighborhood to do some window shopping and wander around. Good thing we were thinking window shopping cause pretty much everything was closed again due to the holiday. Except plenty of bars were open to watch the Euro Cup. We wandered around the neighborhood in search of more of the beautiful spiral staircase we saw on yesterdays ride in the , stopped at a yard sale and hung out in the Mount Royal Park. For lunch we went to Schwartz’s for a famous smoked meat sandwich. The place was pack, even though we missed the big line we saw earlier by eating late in the afternoon. The sandwich’s are two little pieces of bread with tons of meat in the middle. Like two pound of meat in the middle. Insane. It wasn’t my favorite thing to eat, but it was ok. Other people really like it, so I guess I’m just weird. After that I got a mini tiramisu in jar from Juliette & Chocolat. We continued wandering around the neighborhood of Le Plateau-Mont-Royal before deciding to head to the water front to this Love Sunday location. We were delayed when we stumbled on Rue Ste Catherine E were we had seen people celebrating for gay pride week the day before. The street was lined with pink ornaments for several blocks and there was installments of furniture and viewing platforms all over. We should have cycled over for the parade the day before, but it was still fun to walk down with all the people hanging out with out a parade. We finally made our way to back to the water front where we checked out a sandcastle building competition the artificial beach they had along the marina. The containers they turned into offices for the beach were pretty sweet, I thought anyway. We decided we need to to go up and down another 192 steps and climbed up the old clock tower. Finally we made our ways to Love Sundays. Now we were expecting a laid back party, like one you would in Prospect Park on Sunday afternoon. This was NOT the case. We could hear the music coming from the open bar above us, and were unsure if we should even go up, but figured, what the hell. After loosing our water bottles at the security check we entered a sad little techno party. It was actually pretty hilarious, or I should say some of the characters up there were pretty hilarious. We ordered a half pitcher of sangria and watched and wondered what the hell that guy was thinking. The space, Terrasses Bonsecours, would be pretty sweet for a party though. We finished the evening hoping it would rain would hold off at a sports bar with outdoor seating undercover waiting for the fireworks to start. The fireworks did finally start. And they were far away and tiny. This woman had been waiting with her kids forever and they missed them because they barely made it above the trees. I guess we were not the only ones misinformed/disappointed. Still we had a great time in Montreal and would have loved to have spent more time there. The next morning we got ourselves to the train station bright and early to enjoy a rainy but gorgeous ride down to New York. This entry was posted in Perishable Item, Travel, Uncategorized and tagged biking, Mies van der Rohe, Montreal, Schwartz's on July 17, 2012 by perishableitem.